Beag's Art Corner - traditional and digital artwork - Furtopia | Family Friendly Furry Forum and IRC Chat! No critiques, please. I already know my art needs improvement, and while some words of wisdom may be nice later on, I'm not quite ready for that yet. There's a good chance I'll be posting on here daily, as I hear that one of the best ways to improve art is to draw every single day. 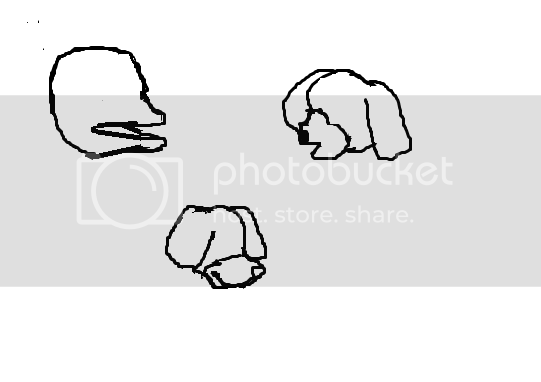 So without further ado, my first piece of work is mostly just practicing drawing muzzles and snouts. The top two were following a tutorial over here, while the bottom one followed this tutorial. Also, any suggestions for things you'd like to see me try drawing are much appreciated. Avatar by an old tumblr friend. The muzzle of the lower character looks good. with heads. Then eyes are a good place to go.